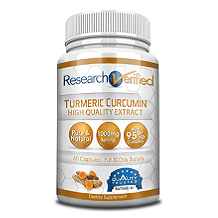 This Turmeric Curcumin Platinum Review examines the dietary supplement manufactured by 1MD. These Turmeric Curcumin Platinum capsules are intended to promote healthy joint function, to lessen problems such as joint cracking or popping, to increase the body’s ability to fight free radicals through its antioxidant support, and to provide benefits for the immune system, the liver, and one’s cognitive health. Per serving, this product offers 1,000mg of Turmeric Curcumin and 5mg of BioPerine. The BioPerine increases the ability of the body to absorb the Curcumin. The supplement is encased in vegetable cellulose (Veggie Caps) which are non-dairy, non-GMO, gluten free, soy free, preservative free and vegan. The recommended serving size for this supplement is two capsules per day, which provides a total of 1,000mg of pure Turmeric Curcumin and 5mg of BioPerine daily. Our research indicates that this dosage is higher than many similar products on the market, which is an advantage. The dose is not too high; indeed, research seems to show that the body can tolerate doses of up to 8g of curcumin with relatively little negative side effects. The use of this product must be discussed with a physician for any person that is pregnant, nursing, taking medication, suffering from any medical condition, or under the age of 18. We also have noted that this supplement is not intended to be used to treat, cure, or prevent any disease. 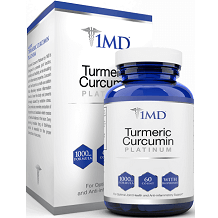 One bottle of 1MD Turmeric Curcumin Platinum containing 60 capsules (a 30-day supply) is listed at $45 per bottle on the manufacturer’s website, and discounts are available to those who wish to purchase multiple bottles at one time – for three bottles, the cost reduces to $38.33 per bottle, and for a purchase of six bottles, the cost for each bottle is $33.17. In addition, for purchases of three or six bottles, the manufacturer offers free shipping within the US. 1MD offers a Satisfaction Guarantee on this product. If the purchaser is not satisfied with the supplement, they may return the remainder within 90 days and receive a full refund. It is not clear from the guarantee whether any shipping costs would be refunded as well for purchases that are returned, or if there are any other exceptions. In summary, our Turmeric Curcumin Platinum review has found that this product provides a significant amount of curcumin as a daily dietary supplement and includes BioPerine in its formula, which increases the body’s ability to absorb the supplement directly into the bloodstream. The product is encased in a natural, all-vegan capsule. On the flip-side, some sources indicated that the product is often out-of-stock, which would make us wary to begin following this regimen if we were not certain how readily available the supplement would always be, particularly since many users reported feeling benefits only after a few months of use. Indeed, each container only contains one month’s supply of capsules, which would be a factor to consider when assessing the affordability of continued use of the product. And some individuals may be less inclined to take a supplement that requires taking two daily tablets as opposed to just one capsule per day, which would be a simpler, more convenient option.